You may have noticed that when you make a call or answer one in Skype, your global Windows sound may lowered in order let you to hear the call better. Often, this behavior may not be desirable. So here’s how to modify the default settings! 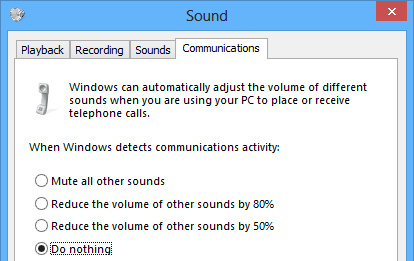 First of all, you must understand that it’s NOT Skype that’s turning down da volume, it’s actually Windows: it detects conferencing/phone call applications (aka Skype) and reduces the overall volume when one is used. This can sometimes messed up online videos volume, live/streaming video feeds volume, etc. which may require a browser restart to get the volume back to normal. That’s just one of the numerous reasons you may not want this behavior.